I’m incredibly drawn to punk’s spirit of rebellion and its embracing of individuality. Growing up in the suburbs, there was so much pressure to fit in, to be seen as “normal,” and going to punk shows was thrilling for me because it helped me realize it was okay to want other things. I went to college in Philadelphia at the University of the Arts and studied screenwriting, where my classmate, Giaco, wrote a script that would eventually become THE RANGER. I fell in love with the concept of a group of punks going up against this figure of authority, someone who deems them less than, because they don’t conform to what he values as worthy. I find personality types like this terrifying-- ones that say you have to fit into some cookie-cutter mould or else you’re living your life wrong. Punk is all about fighting that. 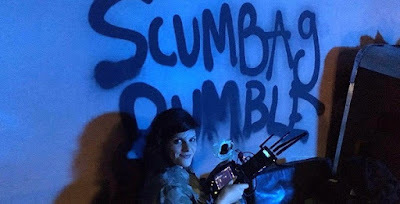 I wanted to combine the outrageous, absurd humor of 80s punk movies with the thrill of the slasher, all circling around a girl who’s trying to figure herself out in the face of others telling her who she should be. Throughout the film, Chelsea is trying to unravel memories about her childhood, which informed the bubblegum, candy colored aesthetic — sweet on the outside but getting sour the more her memories are revealed. Overall I wanted the film to have an EC Comics vibe, to feel larger than life, with the world of the punks and the world of the Ranger colliding, both visually and musically. We start the film in the punk club, with all these insane colors, and when the punks escape to the woods they bring those colors with them, invading The Ranger’s rustic, Smokey-the-Bear parkland.